Luinux was an Internet Gateway for your home network equipment (PC, VideoConsole, TV, oven, ...). Luinux comes preconfigured so, ideally, you just have to install it and play. Once installed in your server PC, you get a Debian/Linux based installation with many features. Rate this project Imad Sousou has announced the release of MeeGo 1.2, a Linux distribution tailored to a variety of mobile devices using the Intel Atom and ARMv7 processors: "Today we are announcing the project release of MeeGo 1.2. The MeeGo 1.2 Core operating system provides a complete set of enabling technologies for mobile computing. Some highlights include: MeeGo reference kernels supporting a variety of Intel Atom and ARMv7 platforms; QML application framework and extended Qt-Mobility APIs, including additional location, system, connectivity, and sensor/haptic capabilities for; enhanced telephony and connectivity capabilities, including GSM, GPRS, and HSPA+ network support. This release also includes Netbook UX 1.2 complete set of core applications for netbooks; in-vehicle infotainment (IVI) UX; tablet developer preview." Read the release announcement for full details. Here is a quick link to download the netbook edition: meego-netbook-ia32-1.2.0.img (864MB, MD5). 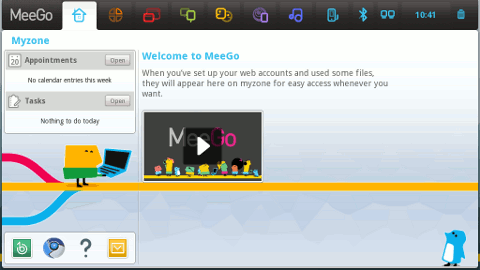 • 2010-08-03: Distribution Release: MeeGo 1.0 "IVI"
Valtteri Halla has announced the release of MeeGo 1.1, a Linux distribution designed for mobile computing with a custom user interface: "Today we are announcing the project release of MeeGo 1.1. It provides a solid baseline for device vendors and developers to start creating software for various device categories on Intel Atom and ARM 7 architectures. The 1.1 Core OS provides a complete set of enabling technologies for mobile computing. The MeeGo stack contains Linux Kernel 2.6.35, X.org server 1.9.0, Web Runtime, Qt 4.7, and Qt Mobility 1.0.2, supporting the contacts, location, messaging, multimedia, and sensor and service frameworks. It also includes a number of leading-edge components, such as the oFono telephony stack, the ConnMan connection manager, the Tracker data indexer...." Read the release announcement and release notes for additional information. The Netbook edition of MeeGo 1.1 is available for download from here: meego-netbook-ia32-1.1.img (823MB, MD5). 2010-08-03 Distribution Release: MeeGo 1.0 "IVI"
MeeGo is an open-source Linux project which brings together Moblin headed up by Intel, and Maemo by Nokia, into a single open-source activity targeting netbooks and other mobile devices. MeeGo for IVI (In-Vehicle Infotainment) Version 1.0 was just announced: "We are pleased to present this 1.0 release of MeeGo for IVI. As part of this release, we are including a sample IVI home screen and taskbar, using the included Qt framework, and designed with Automotive Center Console HMI requirements in mind. We have also included some automotive specific middleware components and a few sample applications, including sample navigation program (Navit) and a sample dialer application (BT-HFP Dialer) which uses Bluetooth and a paired phone...." Read the rest of the release announcement and installation instructions for further information. Download: meego-ivi-ia32-noemgd-1.0.1-20100729.1.iso (441MB, MD5).